Journalists, so those opposed to properly independent press self-regulation like to tell, are the only people qualified to pontificate about journalists. Conversely, journalists are by definition qualified to pontificate about any other occupation, and this they do, as witness the crash earlier today of a Germanwings flight in the foothills of the French alps. None of the 144 passengers and six crew on board is believed to have survived. As there are unlikely to be any aboard who lived to tell the tale, and the cause of the crash is not certain, there is an information vacuum. And the rolling 24-hour news Speculatron (tm) abhors a news vacuum: something, anything, must be created in order to fill the void. In the case of Mail Online, this has meant desperately searching through past accident and incident reports and drawing pointlessly wrong conclusions. First, a few facts: the aircraft operating the flight from Barcelona to Düsseldorf was an Airbus A320, registered D-AIPX. It had been manufactured in late 1990 and entered service with Lufthansa early the following year. Recently it had joined the Germanwings fleet (this carrier is effectively Lufthansa’s low cost subsidiary). Its age suggests the aircraft was nearing the end of its service life. 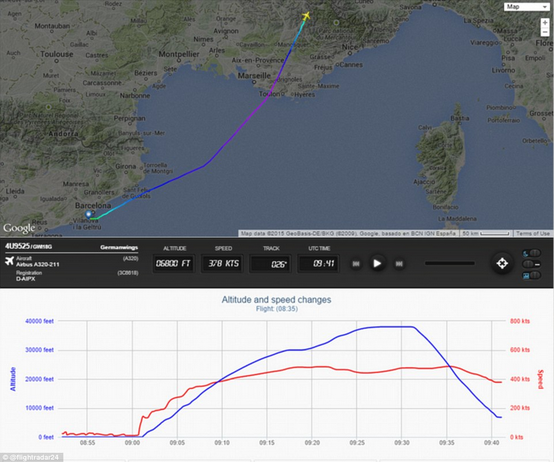 The flight took off from Barcelona just after 0900 hours. At 0932 hours it was in the cruise at an altitude of 38,000 feet when it initiated a descent which lasted around nine minutes and had an average rate of 3,500 feet per minute. The aircraft maintained a straight course during this period. No distress call or other communication was made by the aircraft. The plane flew into terrain soon afterwards. That is what we know. But it is not enough for Mail Online, and nor is the mildly inconvenient fact that the Cockpit Voice Recorder (CVR) and Flight Data Recorder (FDR) are likely to be recovered - and then interrogated - relatively swiftly. No sirree. Out comes the speculation: “Revealed: Germanwings flight 4U9525 received safety warning just four months ago after sister plane went into tailspin”. There was no tailspin. It gets worse: It wasn’t the same flight. It wasn’t, technically, the same carrier: “the Lufthansa jet, with 109 passengers and crew aboard, was at 31,000 feet when it started to descend without any input from the pilot, at a rate of 4,000 feet per minute, before the flight crew managed to regain control at 28,000 feet”. The cause? “the Lufthansa aircraft's Angle of Attack probes got blocked while flying between Bilbao and Munich”. And that has been ruled out in the case of today’s crash. Initiating a descent at that rate is characteristic of a sudden loss of cabin pressure - but there was no levelling out at around 10,000 feet, as might be expected. And the lack of communication is hard to explain. There is little else to go on, so until the CVR and FDR and recovered and their contents analysed, even the 24 hour rolling news Speculatron can add no value. No purpose will be served by doing so. So don’t, hacks, for once in your lives. "just four months ago after sister plane went into tailspin”. An uncontrollable tailspin, which was, er, controlled. Re "not technically the same carrier" - absolutely! 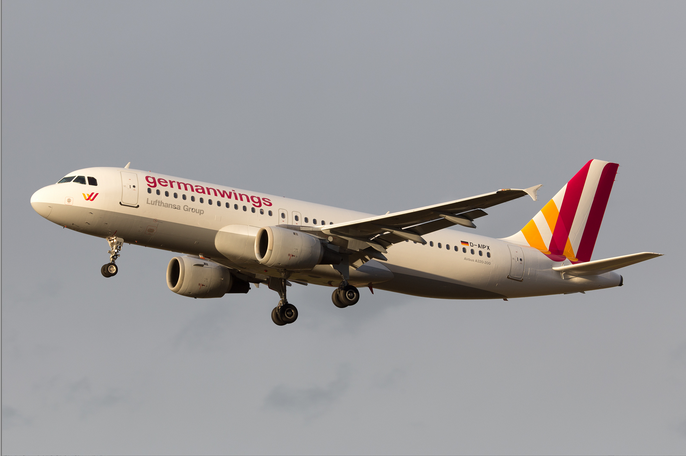 Germanwings and Lufthansa have separate AOCs and are independently managed within the Lufthansa group. I can't imagine the Daily Fail referring to an Iberia plane as BA's sister aircraft, although maybe that's a lack of imagination on my part. As soon as I heard this I suspected it was deliberate and this now looks the likely cause. Despite what the Mail say it is very rare for planes to descend at a set rate, if before the incident they were on autopilot at 38,000 ft.
Pilots will intervene if there is a problem, that's what they are trained to do, especially if they are 7 miles above the ground, with plenty of time to assess the situation and find a solution. The intervention attempts will be recorded by ATC and show on radar. Straight flightpath at a steady descent rate and no comments from the cockpit did not suggest a mechanical problem.